As many of you know, City Council began the yearly budget process earlier this spring and has been holding regular budget work sessions ever since. Now is the time for them to learn about the budget forecast and begin to make important decisions about where to allocate those funds. Unlike last year, this year’s budget will have much less room for major spending increases or shifts in spending. The exemption does not have a significant impact on household affordability. The HEx will not pass down any savings to most Austinites as most Austinites rent their homes. The average homeowner saved $14 with last year’s 6% exemption. Increasing the Hex would shift the taxing burden from established homeowners to low-income renters. This regressive taxation policy is not appropriate for a progressive city like Austin. Our city cannot afford to shift millions of dollars away from other necessary expenses and programs. If the HEx is increased by 5 percent, it would cost an additional $9.1 million in 2016-2017. This is equivalent to over 50% of Neighborhood Housing & Community Development’s 2015-2016 budget. Friends of Austin Neighborhoods does not support an increase to City of Austin’s homestead tax exemption. Our membership believes the relatively minor annual financial impact to homeowners does not outweigh the negative impacts to the majority of Austinites: renters and those benefiting from properly funded COA programs. Adoption of a 20% homestead exemption (HEx) would shift City taxation away from affluent, low-density Council districts towards the middle-class and Latino neighborhoods. The plan, a campaign pledge by Austin Mayor Steve Adler, was to phase in tax breaks to knock 20 percent off of the taxable value of homes. I’d really like to see a vote on this since it’s such an important issue and could cost the city a lot of money to implement. I’d really like to hear what others have to say about the issue too! Please let us know. All voices matter, including those who own homes and those who rent. I’d also like to hear what others think about this issue. Thanks for bringing this issue to the forum, and for providing informative links where we can learn more about the issue, @NatalieGauldin. It seems the city should avoid, or at least be very cautious, singling out classes of people with certain types of living arrangements for advantageous treatment under the tax code. (1) The purpose of the homestead exemption is to redistribute the property tax “burden” in favor of owner occupied homes at the expense of owners of commercial properties (hotels, office buildings, apartments, etc). In aggregate it means less tax for “the people”, more for “business”, which is generally viewed as “progressive”. (2) Independent of whether you think (1) is a good thing, we have a documented issue with the fairness of the property appraisal system, where, on average, the appraisals for commercial properties are considerably below market value compared with the spread between appraised and market value for owner occupied. To implement the system that is supposed to be in place, something needs to be done to re-balance the appraisal inequities. I believe most left, right, center, independent would see that as a statement of fact. In my opinion, the homestead exemption is a perfect tool to do that, as per (1) that is it’s design point. If nothing else, please make sure you understand this point. (3) We have a “progressive” property tax system, if you believe appraisal value = ability to pay (which is not true for many, so it can be very regressive). The analysis which showed if you pay $10 in taxes, and another pays $2 in taxes; then reduce that by 10% to get to $9 in taxes and $1.80 in taxes proves it. At that level, increases or decreases against a progressive system, are neutral, and if looked at one a one dimensional plane (as happened here) not very useful in advising on financial policy. What would be very useful and informative for all would be an analysis of what a spending neutral re-balancing would look like, then points (1) and (2) would be clearer. As CM Garza implied, the tools are far from perfect, but we do have latitude to work around them as part of a “set”, especially with the City owning the primary utilities. Please let’s not aid ward politics finger pointing, it’s refreshing that none of our Council Members have gone down that path. Thanks for offering these perspectives, @Phil_Wiley. The essential point, as I interpret it, is addressing the alleged inequity in the tax burden on commercial versus residential properties. It sounds good to exempt residential homeowners as a way of partially addressing the inequity, but let’s walk through the actual effects of the homestead exemption. The caveat is that I’m no expert on these matters. As @NatalieGauldin noted, renters compose a majority of residents in our neighborhoods. Most renters live in apartment complexes and pay property taxes indirectly in their rents. The owners of the complexes pay commercial tax rates based on commercial assessments. I suppose you could argue that renters are therefore burdened less than homeowners by the current property tax system. However, homeowners enjoy a great deal of advantageous treatment separate from property taxes. The federal government subsidizes mortgages in several ways, including quasi-governmental entities (Fannie Mae) that help to provide lower mortgage rates than the market would otherwise allow, and providing a mortgage interest deduction on federal income taxes. In fact, an old friend who used to work for the IRS told me I should purposely not pay off my mortgage and instead put the money in investments that have higher returns than mortgage interest. Also, property tax increases on homesteads are already capped at 10% per year, another advantage for homeowners that renters do not share. Other classes of homeowners (the elderly and veterans, if I’m not mistaken) enjoy further exemptions and caps. It’s thus not at all clear that renters are being subsidized overall. Homeowners enjoy far more subsidies than renters. Finally, the city must make up for the lost revenue due to a homeowners exemption. It will do so by raising rates across the board. To the extent the city raises renter support funds, the funds will come out of revenue indirectly paid, in part, by renters themselves. BTW, @NatalieGauldin did not characterize the rate structure as regressive. She pointed out that shifting the property tax burden to renters is regressive in its effect due to renters tending to have lower incomes than homeowners. I live in area without many renters. Allandale, North Shoal Creek, Crestview, Brentwood, Highland have majority homeowners paying exorbitant tax bills due to the reduction in the HEX, so, as one of these folks, I want the HEX restored to its 2013-14 level. The loss of the HEX in 2014 increased my overall tax bill by @40% - and even with whatever deductions and low interest rates I’ve enjoyed since purchasing in 2013, the bill still hurts. And yes, it will go up 10% next year. I do not want to contribute via my tax bill to any more city programs. I also don’t believe that city sponsored programs will do anything lasting to provide real, sustainable, structural improvements to affordability. Not that the city doesn’t mean well or is incompetent in administering these programs - I simply much prefer setting Austin on a path to have relative affordability gained through an increase in supply and improvements in connectivity. This is best accomplished by revising how the city does business with its commercial partners, along with removing current zoning obstacles. At the risk of sounding like a certain orange floppy haired menace, the city has a history of making bad deals, and this is the biggest challenge facing anyone concerned with addressing affordability, equality, and access. In my view, Austin needs to forcefully shift itself away from depending on property taxes (a suburban strategy) and develop income streams from volume transactions on sales, fees, and permitting associated with commercial development. Significant changes could be made in these areas that will benefit the city for years, and remove the overwhelming burden of revenue from residential homeowners. My strategy doesn’t do much to help renters in the short term, and it certainly could be characterized as regressive. However, balancing out the needs of existing homeowners and incoming new residents calls for immediate cash flow solutions and a fairly radical ‘gut-check’ by Council in order to put the city on a path towards successfully dealing with problems of affordability over the long term.
" As the reader can see, HEx is a regressive re-allocation. In ‘progressive’ taxation, a greater share of tax burden is allocated towards those with higher incomes. HEx achieves the opposite of such an effect when examined at the district-level;"
Apparently this view was further promoted by the “Chronicle”, and appears to be yet again in last week’s edition. HEx is not regressive. High incomes and high property values increasingly have less correlation for long time homeowners in a rapidly escalating real estate market, and people are being taxed out of their homes. What the Chronicle also pointed out is: “the share of revenue provided by property taxes has grown from 30% to 41.6% since 2005-06”, which sounds to me like a better problem statement. I’m not taking a position on how much each group should pay in taxes, just pointing out that the TCAD appraisals are documented through extensive analysis as being inquitable, there was a lot of interest in making them more equitable, and HEx is a way to do that. I’m not claiming to be an expert, but I do have an MBA, did become a Certified Managerial Accountant (CMA), for a while,in order to supervise teams with MBA’s doing work that, like this, included “budgeting”. I’d love for the author of the redistribution work to become a FAN, as he cares about social issues, and it’s an impressive data mining exercise, it just misses the mark a bit on the business analysis side. I would like to thank and applaud @NatalieGauldin for her leadership in introducing the need to look at how City policy can impact affordability, and would like for FAN to expand that initiative to include more areas, but respectfully suggest this resolution not be included in this week’s vote. I think you’re confusing two applications of the regressivity concept, @Phil_Wiley. One is the regressivity of a tax rate structure. If property tax rates are the same percentage for everyone, then the rate structure isn’t regressive. But whether the homestead exemption is regressive in its effect (not due to the raw rate structure) is another matter. The argument is strong that it is, indeed, regressive in its effect based on it shifting more of the tax burden to renters, who generally have lower incomes than homeowners. Let’s say we exempted from taxation anyone who eats caviar. You don’t see how such a policy would, in effect, be regressive? As for whether to include it in a vote - FAN’s policy is to empower the membership to decide after providing sufficient time for deliberation. I think it’s a bad idea for FAN leaders to impose a screen that denies the membership this opportunity. @rcauvin, HEx is one tool in a tool kit. It increases the amount that commercial entities pay - you are much more likely to see caviar eaten on one of their expense accounts, than you are by a property owner who has lived here 20 years and seen their property taxes sky rocket - 1.1 to the 20th is 6.73… this is not a simple redistribution from home renter to home owner, but there are other tools to help renters, and what is available in aggregate is all that matters - the government limits what individual tools can accomplish. Co-op’s and subsidized utilities are two pretty powerful examples of other tools available for low income renters, CM Casar is recommending another. I would never deny the group a chance to vote on something, just question whether it has been fully debated at this point, much less supported as proposed. The board has heard from two members asking that the exact opposite be in the resolution, and just one member who supported the resolution being put to a vote before there was any debate. Not very compelling in my book. @Phil_Wiley, you seem to be ignoring points that I’ve already made. First, “commercial entities” include apartment complex owners who pass expenses on to their tenants. So the point still stands that exempting lucky homeowners from a portion of taxation effectively raises the share of taxes paid by renters, which is regressive in its effect on residents. Second, if the city raises renter support funds, the funds will come out of revenue indirectly paid, in part, by renters themselves. This discussion was opened 17 days ago. There has been plenty of time for debate. Though I saw some alternate points of view, I didn’t see anyone propose an “exact opposite” resolution. Did I miss something? @rcauvin, I think we are in sync, just saying things differently and emphasizing different points. With a homestead exemption home renters will pay more. With a homestead exemption the combination of home renters + home owners will pay less in total, as some is redistributed to other types of commercial properties. If the City raises renter support funds it will come out of the general fund, which home renters contribute to. I think there is merit in understanding what needs to be done to get the system to work the way it is supposed to, which means having commercial properties, including apartments, etc…, pay proportionate with market value, and the homestead exemption is a way to do that. I also think it is important people understand overall systems are regressive or progressive, individual tools are just that and do not have to be each perfect in every way in order to reach a desired overall outcome. I think you are debating the equity in the system that is in place overall, including Federal policy, and see the homestead exemption as putting things further off the desired course. 4 days ago I suggested increasing the homestead exemption should be part of the mix, 6 hours ago @marmstrong18 said he wants the HEX restored to its 2013-2014 level. 14 days ago @Pete_Gilcrease said he’d really like to see a vote and hear what others have to say. I’ve had my say, respect that we do not all have to see things the same way, and thank all for contributing to the debate! Phil - I don’t understand what the mechanism is that makes commercial properties pay more in your equation. $9M is only 1% of the $900M general fund budget, not immaterial, but certainly less than forecast accuracy variability on spending and revenue. Increasing the homestead exemption decreases what comes in from one general fund source (home owner property taxes), so over time more money has to come from other sources (commercial property taxes, sales tax, utility transfers, etc) to keep the lights on. Think about what would happen if the exemption went from 6% to 50%, and how much other areas would need to increase funding to cover the shortfall as the concept is the same - it isn’t like the City would just stop spending. In an environment where the taxable valuation on properties is going up almost 10% per year, merely not decreasing the tax rate as much as otherwise could have been done to achieve a given funding level would be a way to do it and have the re-distribution be completely within that one funding source - from homestead properties to non-homestead properties. That is more likely than a sales tax increase, or increase in utility transfers - as we may have another issue there since the wet cool weather has likely lead to a significant shortfall year-to-date in utility revenue vs. plan. Ah ok. So there’s really no reason why commercial properties would pay more, and the HEx would do nothing to increase that likelihood except increase budget pressure. And if taxable valuations keep increasing you would have to keep increasing the HEx to match it or else the city would continue to have the same amount of money to spend and there would be no budget pressure. It still seems to me that drastically increasing the number of taxable properties would be a much simpler way to solve this problem. Rezone a ton of properties to SF-6 and easily allow owner-occupied townhomes all over the city and we would be more likely to see stabilized tax valuations. Is this the final resolution wording below? I’m not a fan of the exemption. I think it will make very little difference to homeowners, and cost the city money it can ill afford to lose, which is better used to address other priorities. Well written opinion from the Statesman attached below, which a lot people who vote put a premium on - punch line is “The 6-5 vote should have been unanimous”, the logic behind it is worth the read. Looking back on the FAN discussion thread, @tthomas48 advocated instead for “drastically increasing the number of taxable properties would be a much simpler way to solve the problem” @marmstrong18 advocated instead for “setting Austin on a path the have relative affordability gained through an increase in supply and improvements in connectivity”. Both are consistent with Imagine Austin, and helping implement that vision / strategy is why many of us are here. Let’s not lose the “war” because we picked the wrong “battle”. 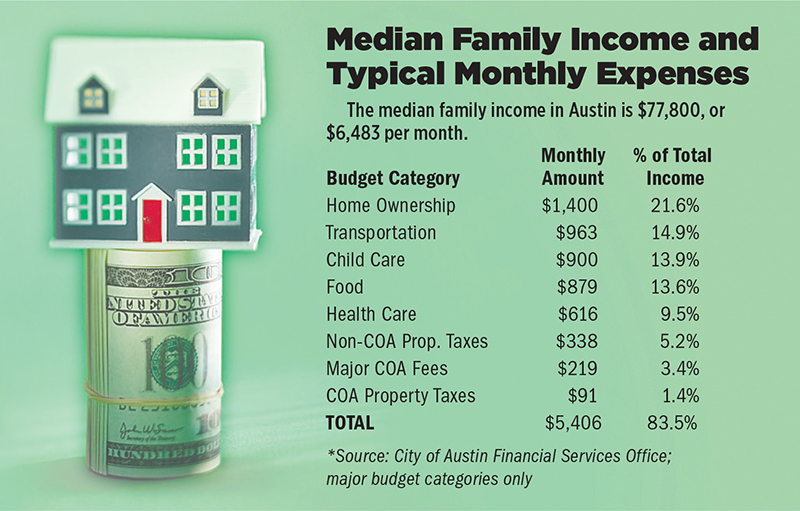 Expanding the city of Austin’s homestead exemption helps the rich. True. Expanding the city’s homestead exemption helps low- working- and middle-income families. Also true. That is why the Austin City Council’s narrow approval recently to expand the homestead exemption – from 6 percent to 8 percent — made little, if any, sense. The 6-5 vote should have been unanimous, given current homeownership rates in Austin and the years of neglect homeowners have endured regarding tax cuts. About 48 percent of Austin’s population live in owner-occupied homes, compared with about 52 percent of city residents who live in rental units. Rentals do make up a larger share of city housing units at 55 percent, but owner-occupied homes still are significant at 45 percent. There’s also the politics: Mayor Steve Adler and most other council members promised to establish a meaningful homestead exemption during their 2014 campaigns. But even council members who did not support that idea rely on revenue that homeowners pay in property taxes to finance services for renters in their districts. So the financial interests of renters and homeowners are linked in an integrated city government that works best when it works for all. Ignoring one segment, such as homeowners, imperils another, such as renters. Nonetheless, the decision over the exemption was cast in terms of the rich gaining at the expense of the poor — certain districts winning, while others were losing. The exemption will knock 8 percent off of the value of a home for city tax purposes, which would save the typical Austin homeowner $23 a year on a home valued at $250,000. Garza and other council members who voted against it – Ora Houston, Sabino “Pio” Renteria, Greg Casar and Kathie Tovo – believe the savings is too small to justify the $3.8 million it will cost the city. But the goal is to continue expanding it until it reaches 20 percent, which would be substantial. Several council members view it as a budget drain. If they saw it from the eyes of homeowners, they would know it’s an investment that boosts their confidence that city government also works for them. And some council members need not look any further than their own district to see that. In Garza’s Southeast Austin district, a majority of residents – 52 percent – own their homes. Household incomes for families in that district do vary, but the single-largest group earns between $25,000 and $50,000, city figures show. That 47 percent of people in that category own their homes is a testament to their drive to grab a piece of the American Dream. A similar pattern is seen in Houston’s District 1 in Northeast Austin, where 49 percent of residents are homeowners, city figures show. It’s worth noting that 44 percent of residents with household incomes between $25,000 and $50,000 own their homes. Homeownership was significant even among those with incomes of less than $25,000, with 30 percent falling in that category. In opposing the homestead exemption, Casar has said that it doesn’t help renters, who make up 70 percent of his North Austin District 4. Similarly, renters make up 74 percent of Renteria’s east-central Austin District 3. No one can argue that they were not representing their constituents in opposing the expansion of the homestead exemption. But one can question their political savvy: They need four other votes to get measures passed that benefit their constituents. Engaging in ward-style politics by supporting only the things that benefit their respective districts will leave council members short in putting together the six votes needed to prevail in a 10-1 system. Garza points out that, as written, the city’s homestead exemption gives the most benefit to the wealthy and the least to lower-income families. I get that. It’s a blunt tool, but the only one the state makes available to cities at this point. San Antonio, Dallas and Houston all offer a 20 percent homestead exemption. City government should not expect Austin homeowners, who are struggling to pay mortgages, taxes, utilities and other expenses, to support a system that neglects them. In this city, homeowners largely have stepped up to challenges by supporting bonds and other measures for affordable housing, higher drainage fees to buy out flood victims, job training programs to lift wages of the underemployed and a myriad of services that aim to help people out of poverty. Yes, there are rich homeowners. They will get the exemption. And then there are the rest of us, who are a paycheck, layoff or illness away from tumbling down an economic ladder that we’ve clawed our way up. We, too, get that exemption. Austin must continue expanding the homestead exemption — if for no other reason than to reinforce to homeowners that their interests count. I read that piece a few days ago. I don’t see where it addresses the arguments against the increased homestead exemption. Continuing to expand the homestead exemption “to reinforce to homeowners that their interests count” is a rather perplexing statement. If there is a neglected group, it’s renters, not homeowners. And increases in the homestead exemption almost certainly make renters worse off. How about exemptions for poor homeowners and no exemptions for rich homeowners or a progressive tax exemption? A progressive tax is a tax in which the tax rate increases as the taxable amount increases. The term “progressive” refers to the way the tax rate progresses from low to high, with the result that a taxpayer’s average tax rate is less than the person’smarginal tax rate. Progressive taxes are imposed in an attempt to reduce the tax incidence of people with a lower ability to pay, as such taxes shift the incidence increasingly to those with a higher ability-to-pay. The term is frequently applied in reference to personal income taxes, in which people with lower income pay a lower percentage of that income in tax than do those with higher income. It can also apply to adjustments of the tax base by using tax exemptions, tax credits, or selective taxation that creates progressive distribution effects.